Walking conditions – Sand and rock underfoot. No difficulties. My wife was born and bred in a west of Scotland seaside town and is therefore an expert on the Gulf Stream. Being regular visitors of Largs my wife never misses the opportunity to inform me that the abundance of palm trees is a result of the Gulf Stream. I must confess that I am now losing the ability to display surprise and wonder at these revelations. Fortunately, our recent trip to Morar allowed my wife to enlighten me on a Gulf Stream fact that I am less familiar with. As it turns out the beautiful silver sand of Morar originates from the other side of the Atlantic and is transported by the Gulf Stream. And what a sight! For this particular walk you don’t really need a route map as it’s basically a walk along one of the most breath-taking and magnificent beaches in Scotland. But for what it’s worth, we set off at the car park which is next to the public toilets on the B8008 a few hundred metres west of the A830 on the south bank of the estuary of the River Morar. From there, follow the short, sandy footpath straight to the beach. At this point, just turn left and walk across the sand in the direction of Muck, Rum and Eigg which you’ll see in the distance. Depending on the tide you’ll be able to walk for about 1 kilometre or so until the coastline bears left in a SW direction. At this stage you’re as well climbing a few feet onto one of the rocky outcrops for sandwiches and an uninterupted view of the islands. It’s then just a case of retracing your footsteps back to the car. Make sure you visit the village of Morar whilst you’re there. If you’re lucky you might catch the Jacobite steam train at the station. And just next to the station across the level crossing, if you take the footpath to the left it takes you on a quick 30 metre ascent up to a fantastic viewpoint featuring a large cross. This entry was posted in West Highlands and tagged coastal walks, steam train railway on October 22, 2017 by scotlandwalkswithchildren. Walking conditions – Well maintained forest tracks. Fairly flat. No difficulties. Normally, when we go for a walk we make our own way back to where we started. However, when you’ve got the chance to incorporate a trip in a steam train as your return journey it’s an opportunity too tempting to pass up. That’s right! Both Aviemore Station and Boat of Garten Station are lying on the recently re-established steam railway. Brilliant! You’ll need a map and a compass for this one as you are on forest tracks and it’s not difficult to get lost. Please pay attention to points on the map that you can identify whilst you are walking. That said, it is a fairly straight-forward, very enjoyable walk along well maintained and generally flat forest tracks with fantastic views of the Cairngorms in the background. 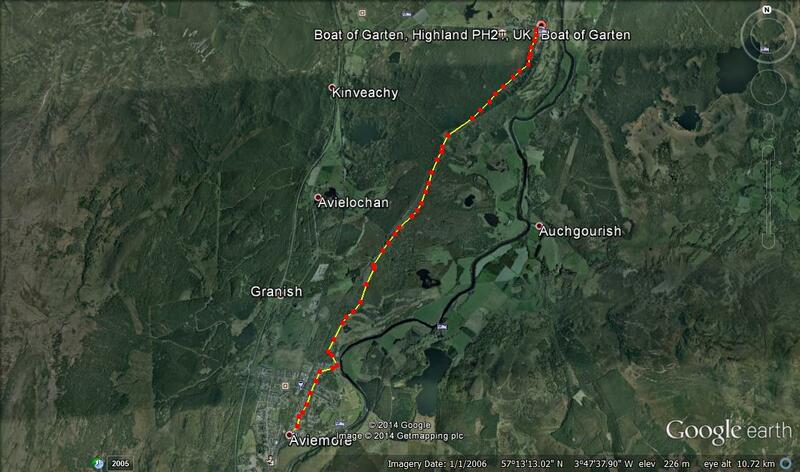 You are more or less walking in a south-south-westerly direction for the full 7.7 kilometres of the journey from Boat of Garten until you reach Aviemore. Aviemore is a fantastic, bustling town with a great atmosphere. It’s one of our favourite places for a mini-break so we would strongly recommend taking some time to wander around To get back to Boat of Garten simply jump on the steam train and you’ll be there in about 15 minutes. What a great day out it is! 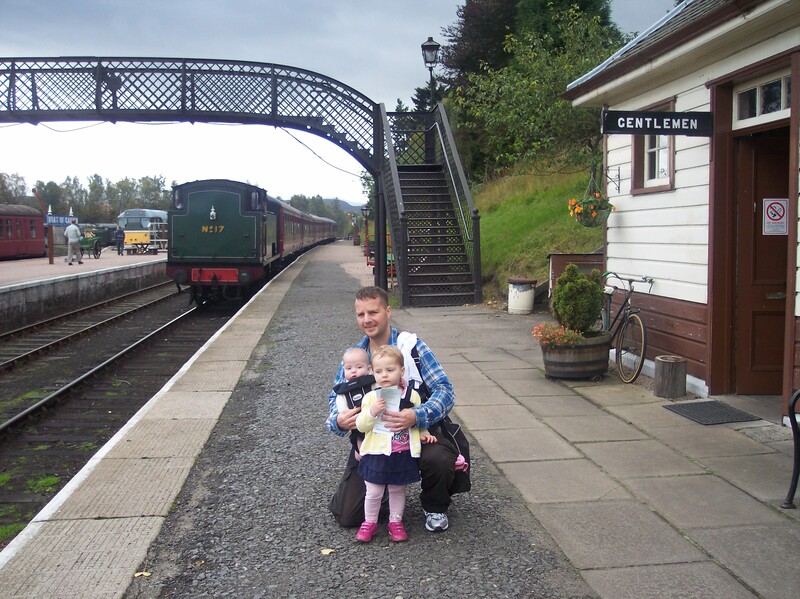 This entry was posted in Perthshire and Eastern Highlands and tagged steam train railway, Strathspey Steam Railway on October 9, 2014 by scotlandwalkswithchildren. Walking conditions – Good footpath with no difficulties. Walking along side of road on return journey. Sometimes you know you’re lucky. This was one such occasion. 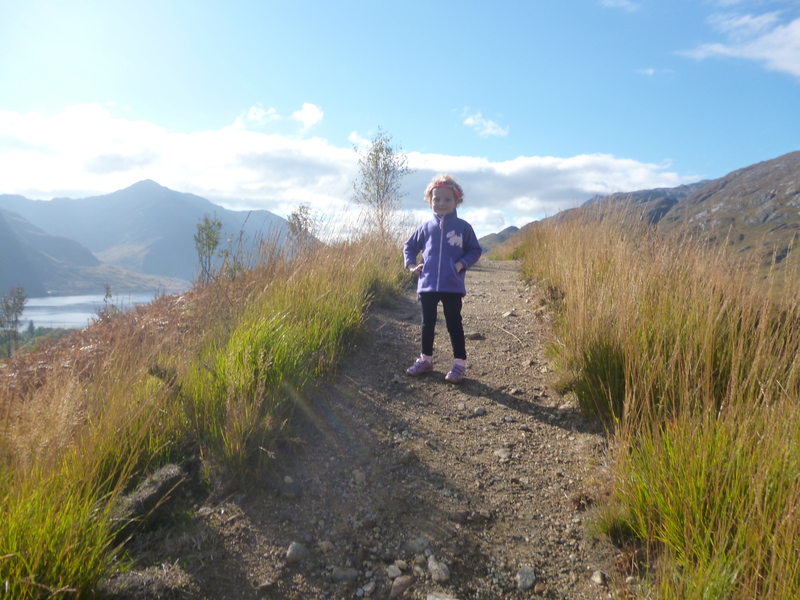 During the school October Week last year we stayed for a couple of nights at the Ballachulish Hotel. To our astonishment the weather on the second day was fantastic so we decided to head off to Glenfinnan. After the usual stuff like visiting the Glenfinnan Monument and having a picnic at the edge of Loch Shiel, we decided to go for a walk. We noticed a track leading towards the viaduct which we duly followed. On reaching the viaduct to our very pleasant surprise, we discovered a newly constructed footpath leading up the hillside. Unable to resist we promptly set off up this footpath. 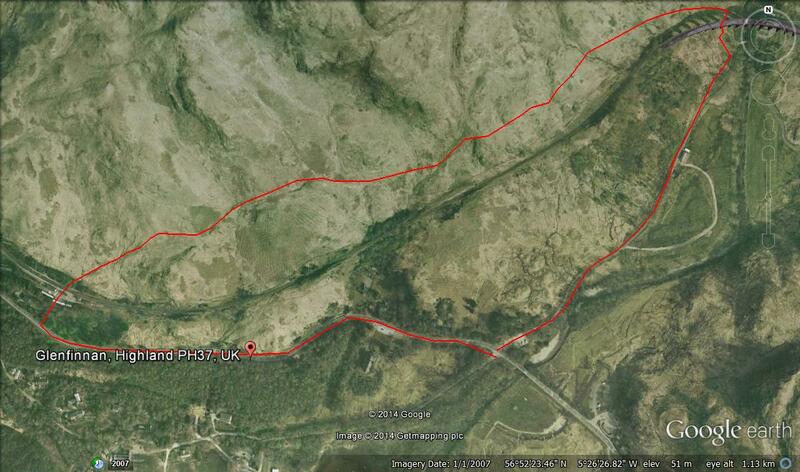 After approximately a 90 metre ascent the path levelled out and skirted along the side of the hill for about 600 metres. This provided us with one of the most magnificent views we had ever witnessed. This statement should not surprise any Harry Potter fans. The footpath then led down to Glenfinnan Railway Station which is also a museum and is something of a must-see for anyone with a passing interest in steam trains. We then made our way back by following the road for 700 metres. As we had a Dinner, Bed and Breakfast deal at our hotel, unlike last time we didn’t go to the Glenfinnan House Hotel where I ate the best steak I’ve ever eaten nor did I then look out the window and see some deer bounding up and down the lawn in the most spectacular fashion. Maybe next time! This entry was posted in West Highlands and Argyll and tagged steam train railway on September 7, 2014 by scotlandwalkswithchildren.